This became my favorite shirt the moment I put it on. The quality and fit of the shirt is perfect. I am 188 cm and 95 kg, and XL fits me perfect. The arms are nice and thight. Soft fabric, not to thin. Have bought the Blue one in size L , and that is also perfect. A bit thighter , but that is what i wanted. 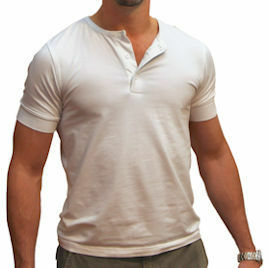 I recommend this shirt if you want a good quality Henley shirt that can be used for all occasions.